Since 1837, Holt Renfrew has been renowned for offering its clientele high-quality luxury clothing and accessories, along with best-in-class customer service across nine stores. As the affluent Chinese population continues to grow internationally, more and more Chinese customs and traditions are being celebrated to address these consumers. 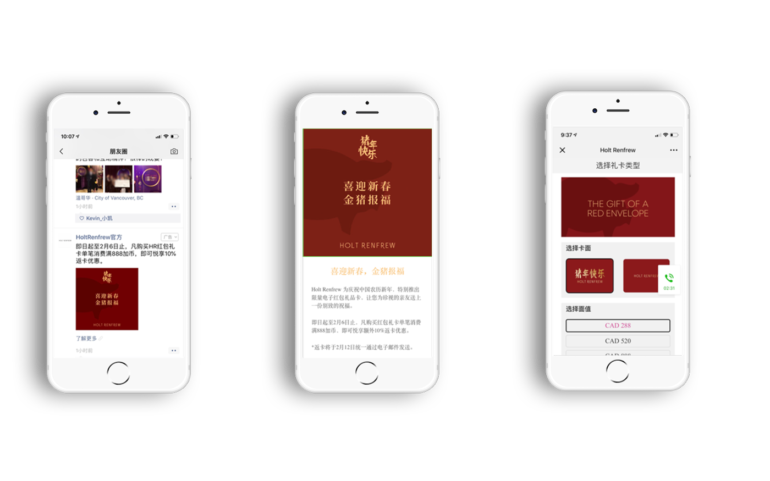 For significant holidays such as Singles’ Day and Chinese New Year, we helped Holt Renfrew develop and execute a comprehensive marketing strategy to best engage local Chinese in Canada. The focus was to provide an authentic Chinese online shopping experience during these important dates. To celebrate the occasion and make the most of this major shopping opportunity, Holt Renfrew released a 48-hour Singles’ Day offer on its eCommerce platform. The campaign ran from November 8 to 11, 2018. Since the campaign was online-only and ran for a very brief period of time, Holt Renfrew relied on Sheng Li’s expertise to really maximize the volume of qualified traffic and sales to the Holt Renfrew site during the short campaign period. This process began with tailored Chinese creative assets and ads. The Sheng Li team took the English assets Holt Renfrew provided and adapted the creative for Chinese consumption. This involved selecting the right font that both resonated with Chinese consumers but also stayed on brand with Holt Renfrew’s overall appeal. It also involved a process we call “trans-creating”, where the copy is not simply translated but rather based on and rewritten specifically for Chinese consumption. Lastly, the imagery was localized for Chinese specific platforms. For example, on WeChat where the ad format was an article, Sheng Li created a beautiful WeChat article to showcase and describe some of the merchandise on sale. On Weibo, where the format is much more brief and almost Twitter-like, Sheng Li developed shorter posts that emphasized more on product imagery. Next, creative and ads were dispersed through a variety of online channels. Naturally, long-standing Chinese platforms such as WeChat and Weibo were the focus of the campaign. Direct banner buys on popular Chinese apps such as dealmoon (the number 1 Chinese discount information publisher) and News Daily (the number 1 Chinese news app) were also used to drive targeted, qualified traffic to the Holt Renfrew site. Sheng Li also creatively used traditionally English channels such as Google Ads to provide support for the other channels through tweaking Google’s language settings. Overall, Sheng Li drove tens of thousands of qualified Chinese consumers to Holt Renfrew’s eCommerce site. Singles’ Day 2018 ended up being one of the most successful eCommerce days in Holt Renfrew history. Advertising return on the campaign was over 10x. Following the success of Singles’ Day 2018, Holt Renfrew re-engaged with Sheng Li to craft a media plan to promote its Chinese New Year promotions. The goal was to drive sales for the Holt Renfrew’s digital red envelopes. Holt Renfrew drew inspiration from this deep-rooted custom for a digital red envelope campaign. WeChat users purchased digital red envelopes in the form of Holt Renfrew gift cards for their friends, family, or themselves. In addition, we leveraged WeChat advertorials as they’re proven to be particularly effective during promotions and events. Sheng Li researched and placed advertorials with 20 prominent WeChat publishers across Canada, which accounted for 80,000 views of the advertorial. Sheng Li also assisted Holt Renfrew to create content that would be most engaging for this audience. Other social channels were then prioritized for their robust ad capabilities. Sheng Li used a combination of different ad technologies to target and to promote Holt Renfrew’s in-store events and promotions. Overall, the Chinese ads generated over 1 million impressions and over 1,000 engagements. Meanwhile, English platforms such as Google Search, Google Display, and others were also utilized to provide multiple touch points for the Chinese audience. Overall, they generated over 1 million impressions and over 4,000 clicks to the landing page. Overall, the campaign generated 2.5 million impressions and over 5,000 engagements. Holt Renfrew achieved nearly 10 times its revenue forecast for the digital red envelope promotion. Accounting for media spend and Sheng Li Digital service fees, the ROAS on the campaign was also greater than 10 times.